Volkswagen Golf had been gaining accolades from those looking for a day to day vehicle, which not only offers fuel efficiency but keeps the standard through its looks and comfort. This already charismatic wagon gets commendable treat through beneath the hood rework done by the largest tuner across the globe, ABT. With the addition this already smart and comfortable choice gets much power to bring it into the segment of sporty vehicles. Let us have a closer sneak into its detailed redesigning by ABT with its ABT Power New Generation. 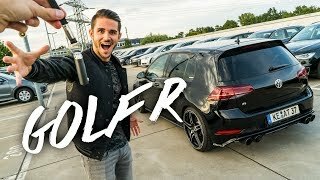 Beside adding massive power beneath the hood ABT has also made some outer changes to ABT Sportsline Volkswagen Golf VII R 370 HP 2014, to let the side-walkers know that this isn’t normal Golf. Changes begin with the front fascia now holding an ABT grille while the front spoiler now comes with an integrated blade in it with redesigned headlight covers making the front fascia look more of ABT. 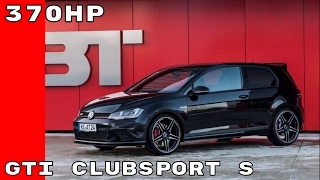 Moving towards the rear fascia of ABT Sportsline Volkswagen Golf VII R 370 HP 2014 changes are noticed through redesigned wing and tailgate, getting bit more attractive than its normal sibling. At the each side of side skirts that match the body color are now fitted dark RD-C wheels that give more aggressive look to the entire ABT Sportsline Volkswagen Golf VII R 370 HP 2014. 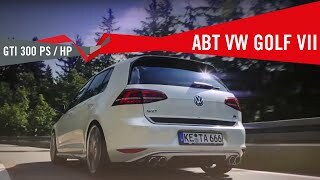 The Engine of Golf now gets some modifications through the ABT Power New Generation and ABT Engine Control which not only increases the power but also keeps an eye upon its efficiency and the same gets a plus point here. Yes despite of enormous hike in power, ABT Sportsline Volkswagen Golf VII R 370 HP 2014 fuel consumption level still remains the same. With enormous hike we here mean 23% increase in power and 17% in torque, it takes the statistics to a whooping output of 370 HP and 460 nm. 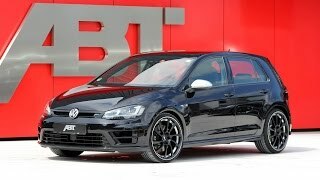 With these figures rolling the new ABT Sportsline Volkswagen Golf VII R 370 HP 2014, this model now is capable of finishing the 0-62 mph sprint in just 4.5 seconds. A commendable decrease by 0.6 seconds, as the base version used to take 5.1 seconds and taking the top speed from 155 mph to 165 mph.